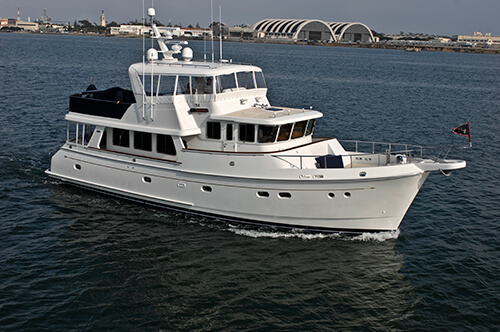 Alaskan yachts have been well known around the world since the first 49' wooden, trawler designs by Robert S. Doris started appearing in the early 1960 -70's. They were built in Hong Kong and gained a huge following among long range, offshore cruisers who were attracted to the looks and performance of the broad shouldered raised pilot house with the Portugese bridge and the salty, husky styling favored by serious cruisers. 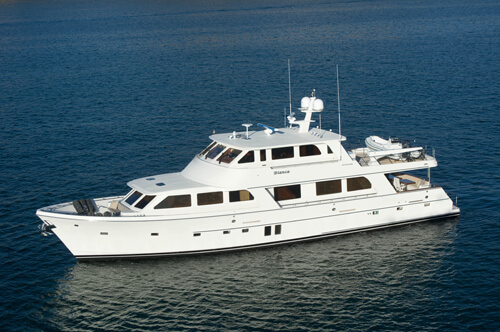 In 1996 Arthur DeFever, was commissioned to design a new, fiberglass 53 Alaskan RPHY to update the proud Alaskan name and extend its reputation into the next generation. 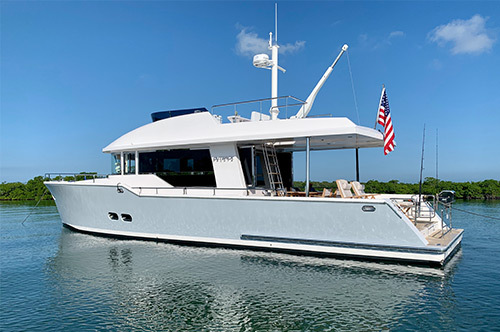 From the very first unveiling of the new Alaskan 53 at the 1998 Ft. Lauderdale Boat Show, the updated Alaskans exceeded the public's expectations and became an instant sensation in the yachting community. Today's modern fiberglass Alaskans are even more stylish, comfortable and seaworthy than their predecessors. However they still retain the same traditional styling and offshore performance capabilities of their early pedigree. Indeed the new Alaskan 55'-100' designs still bare an almost identical physical similarity to the original wooden 49'. Alaskans now feature all of the luxury amenities usually found only on much larger yachts, employing the latest in both building technology and equipment to provide a safe and reliable yacht capable of offshore voyages under the worst conditions. Alaskan yachts are built to work. With the advent of the new electronic diesel engines, Alaskans are no longer strictly limited to trawler speeds, thereby expanding the Alaskan market appeal to a wider base of new followers and cruisers. 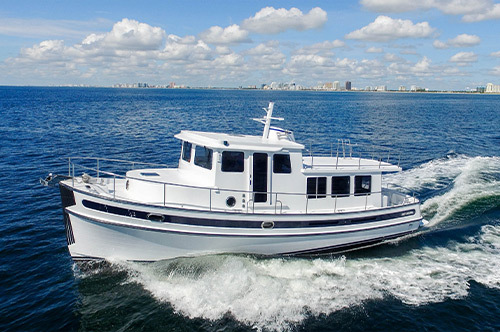 Alaskans are now considered semi-displacement motor yachts and can provide both speed and range for the serious cruiser - with average cruising speeds of 16-18 knots or the ability to throttle back to the traditional 9-10 knots for economical range. Tradition and technology have always gone hand in hand with the development of Alaskan yachts and we are proud stewards of that yacht building philosophy. Currently the Alaskan yacht design is one of the longest running, most successful offshore designs ever in the history of yachting, and is currently poised for substantial growth moving forward into the new millennium - providing cruising pleasure for a whole new generation of Alaskan owners.